The impact of AMPD1 (rs17602729) on sprint performance. Genes are the foundations of our entire body, evolving to make us who we are today. Genes give us traits, some of which are obvious such as eye colour and the number of fingers we have, some are testable but not obvious such as blood type and disease risk, whilst other traits remain a mystery. AMPD1 is a protein coding gene which encodes adenosine monophosphate deminase 1, it catalyses the deamination (the removal of an amine group from a molecule) of AMP to IMP in skeletal muscle. Having a deficiency of the AMPD1 enzyme can cause myopathy and premature exercise induced fatigue, pain and performance failure. To discover if the gene AMPD1 (rs17602729) has an effect on fatigue between bout of max intensity activity in the case sprinting. Times were taken and analysed to check what loss of performance occurred between each sprint bout and if these correlated with AMPD1. DNA samples were taken on the day of exercise testing, buccal swabs samples were taken on iso-helix SK-1S swabs and tested by an iso9001 certified lab. DNA data is only required to be gathered once due to the stable nature of genetic makeup, epigenetic data which may be changeable was not analyses in this study. All participants signed a PAR-Q (physical activity readiness questionnaire) and declared no injuries or conflict of interest on the day. Sprint times were taken using a Brower TC gate with each athlete conducting bouts one at a time. All participants gave consent for the study in which all data was anonymised in both DNA and sprint time recording. Having at least one T variant in rs17602729 causes faster fatigue in between bouts of 60m sprints post 30seconds recovery between bouts. The T variant appears to cause no impact on the initial time of the 1st bout but does impact the times of subsequent bouts. In conclusion athletes that require multiple intervals of power should recover for longer if they have at least T variant in rs17602729. This may impact athletes that compete in sports that require multiple bouts of high output in quick succession such as basketball players. 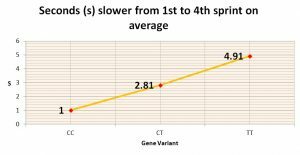 The gene AMPD1 does not appear to affect the speed of the athlete on the initial run and therefore it does not affect power output initially. The following small study shows correlation between repeated power output, fatigue and genetics and therefore a further study with a much larger participant group is recommended to certify if this correlation is reproducible. Collins, Christopher; Resistance Training, Recovery and Genetics: AMPD1 the Gene for Recovery. JOAE 2017, 6, 2, 10.4172/2324-9080.1000256.